Shelby is forever in our hearts. Shelby is a diabetic. She also has some dental issues. Shelby is looking for her forever home. If you think it could be yours, read more about Adopting from BDRA before submitting your application below. BDRA relies on your donations to rescue blind dogs around the United States. Please consider giving in support of Shelby. Shelby is a 6 – 10 year old fluffy tri-color, medium build ( 50 lbs.) 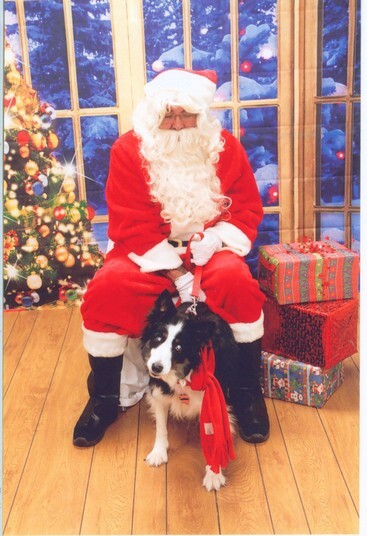 Border Collie from NC. Shelby was found as a stray on the side of the road. We do not know much about her past. My guess is that she was either a farm dog or an outside dog. Shelby either wandered away or was let go. Health wise: She is diabetic and has cataracts. Shelby’s eyes are cloudy from her cataracts, but she may be able to see shadows. With her diabetes – Shelby requires two shots: 7 units of insulin per day. When Shelby was spayed the vets lowered her insulin because she had no hormones. At one point, Shelby spent the day at the vet having her insulin curve tested. They tested her every two hours. Ultimately despite lacking hormones, the lower dose didn’t work and Shelby had to go back up to 7 units. We sometimes use urine test strips to test Shelby’s sugars. I believe you can also buy the alpha track blood test kits too. 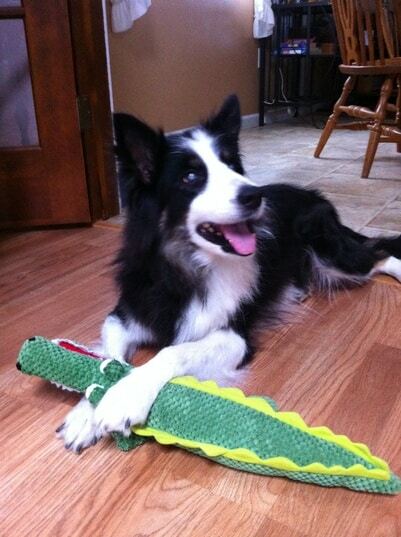 Shelby did have some trouble with an inflamed pancreas and colitis. Luckily with medication and some prescription Science Diet food; Shelby improved and recovered. Shelby’s colitis will flare up from time to time. You can tell because she either has loose stool or is reluctant to eat. The vet said she is reluctant to eat if her stomach is upset. In that case, they give her meds for diarrhea and the prescription Science Diet food. Shelby has to eat in order to get her insulin. Shelby has had UTIs also. The UTIs cleared with medication. Shelby will need to have her teeth cleaned. Some of her teeth are worn down or missing. Luckily, her mouth issues are not preventing her from eating. Shelby does like to chew on chews and bully sticks and she loves the Pedigree Dentastix. Shelby was diagnosed with Capillaria mite. It is rare and affects the nasal passage. There are debates among vets on whether to treat it or not and debates on how to treat it. Initially, the vet left it untreated as it was not affecting Shelby’s overall health. Shelby’s sneezing did increase and there had been mucus discharged which prompted us to call the vet. However, the vet couldn’t conclude if it is the parasite or an infection making Shelby sneeze. The parasite is not contagious so other dogs are fine. Shelby was prescribed antibiotic/Clavimox to rid a possible infection and a dewormer/Panacur powder to rid the parasite. Shelby underwent spay surgery in October. At her age, Shelby was surprisingly still intact and as a stray never had puppies. Being older and diabetic, Shelby had some minor issues. However, her belly is all healed. Shelby is house broken. However, with her diabetes she will sometimes drink more water. Shelby has had a few accidents in the house. Shelby does use puppy pads. Shelby won’t bark or whine to go out. She usually paces by the door when she needs to go outside. Hearing: Shelby can hear. Shelby does get a little startled when she hears new or unexpected sounds, especially other dogs barking. She is becoming more comfortable and less reactionary to the strange sounds. Her reactions include barking back at the sound. Shelby is relatively quiet, but she can bark a lot when nervous or fearful of strange sounds/barks. We try to verbally calm her down. If that doesn’t work, we will use a spray bottle. If overly nervous or very fearful of strange barks; Shelby has reacted by snapping (not biting) if touched from behind. Shelby has ONLY reacted this way if she is extremely afraid of the sounds/strange barks and overwhelmed in new surroundings. Personality: Shelby really is a sweetheart! Shelby is eager to please. And loves being near her people. She LOVES to be petted. Shelby readily accepts affection and gives affection by licking or nuzzling your hand. Shelby’s ears perk up and she will wag her tail when you talk to her or call her name. Shelby also knows some basic commands like sit. She is a relatively quiet dog and is very content just lying by your feet. Shelby will happily take treats. Shelby will even do a tap dance to get treats! It’s been sweet watching Shelby become a “pet” or part of the family. Shelby will sometimes cower and it makes me wonder if she might have been abused. Sometimes when she gets nervous or overwhelmed she’ll freeze up. However, Shelby is getting braver and more relaxed each day. When she first came to our house she would only sleep on the wood floor. Now she likes to curl up on the dog beds and blankets. Shelby doesn’t really play with toys. It’s cute to see her turn her head from side to side trying to follow the squeaks from the toys my dogs are squeaking! Public: Shelby has attended small scale BDRA events. She was a little nervous at first, especially walking into a new and public place. 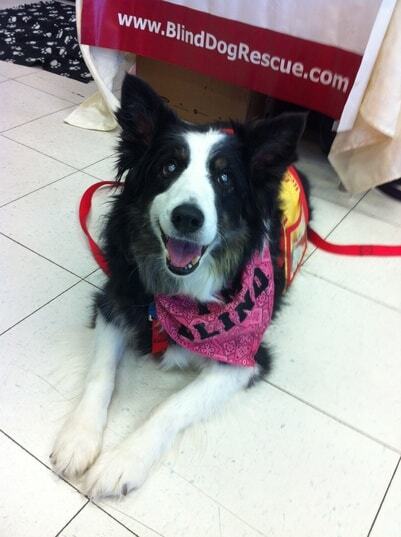 Shelby was a good girl and enjoyed having the customers pet her. Shelby was even brave enough to walk around the store some. Shelby is also a good patient when visiting the vet’s office or being handled by the doctors and vet techs. Home Living: Shelby can manage walking up and down our small set of deck stairs and can walk around the house fairly easy. Indoors or outside – Shelby will follow and come if you call or whistle to her. Shelby likes to be outside and she loves to dig! She will dig a nice size hole and lie down inside it. Shelby doesn’t really climb on the furniture. We have picked her up and put her on our bed. She’ll happily sit with us and the other dogs. Grooming: Shelby is good while getting a bath. Even with long hair, her coat is easy to maintain. She isn’t a fan of being brushed – especially her back tail feathers. Although, she did let my husband and I shave her back end today. Her feathers were getting really long! Other Animals: Shelby is also becoming more comfortable interacting with my dogs and strange dogs at rescue events. My dogs ( and Pixie Sticks Sophie who we fostered for a short time) are younger than Shelby. Plus I have the blind & deaf bossy Aussie! We’ve had no physical conflicts. All of the dogs are respecting each other’s space and are able to co-exist even in the same room, yard, and house. We are making progress. The dogs are slowly starting to make closer, gentle physical contact with no growls. Shelby will approach them, sniff them and even lick them. However, she sometimes gets nervous if they approach her. She will give a warning growl. I think Shelby would be fine with a cat, especially a cat that has lived with dogs. We still separate the dogs when we leave for work. Shelby gets the run of the dining room and my dogs get the run of the living room. On shorter trips, we have left all the dogs out together with no problems. We do separate all the dogs when they eat their meals. However, they have all shared treats and chews together with no problems. Activity: Shelby likes to go for walks and walks very well on a leash. Shelby keeps pace with the other dogs. When we got home, she showed no signs of discomfort or distress – from age or diabetes. Travel: Shelby likes going for car rides. She is able to hop in and out of the car all by herself. She is a very, well behaved passenger. Food: Shelby eats twice a day. We give her two cups of dry mixed with some chicken flavored canned dog food. The chicken is gentler on her stomach. Shelby loves Pup Peroni sticks. Shelby also loves the Three Dog Bakery sandwich cookies. With her teeth, Shelby sometimes has a hard time eating hard biscuits. Shelby also likes the decorated dog cookies. The ones that look like decorated Christmas cookies. Shelby under went spay surgery in October. At her age, Shelby was surprisingly still intact and as a stray never had puppies. Her belly is all healed now. Shelby also attended her second BDRA event. It’s been sweet watching Shelby become a “pet” or part of the family. Shelby came from North Carolina and we do not know much about her past. My guess is that she was either a farm dog or an outside dog. Shelby either wandered away or was let go. Shelby will sometimes cower and it makes me wonder if she might have been abused. When she first came to our house she would only sleep on the wood floor. Now she likes to curl up on the dog beds and blankets. Shelby is still learning and enjoying playing with toys. Although, she still isn’t sure what makes them squeak! It’s cute to see her turn her head from side to side trying to follow the squeaks from toys! Shelby likes to go for walks and walks very well on a leash. Shelby is still a little skittish with strange noises. However, she is becoming more comfortable and less reactionary to the strange sounds. Shelby readily accepts affection and gives affection by licking or nuzzling your hand. Shelby is also becoming more comfortable interacting with my dogs and strange dogs at rescue events. The other day, we took Shelby for a walk with my three dogs. Shelby walked well on the leash and kept pace with the other dogs. When we got home, she showed no signs of discomfort or distress – from age or diabetes. Shelby will sometimes walk or move in a stiff manner. I don’t think it is a physical issue. I will talk to vet to make sure. I think she is a cautious mover and still a little skittish of new/unexpected sounds and environments. Sometimes when she gets nervous or overwhelmed she’ll freeze up. However, Shelby is getting braver and more relaxed each day. Shelby recently made her rescue event debut. She was a little nervous at first, especially walking into a new and public place. Shelby was a good girl and enjoyed having the customers pet her. Shelby was even brave enough to walk around the store some. Shelby is starting to play with and enjoy toys. However, she doesn’t yet understand all of the “squeaks.”Shelby’s ears and head get a work out whenever my dogs are squeaking their toys. Every time she hears a squeak – she’ll move her head from side to side trying to figure out what those mysterious squeaks are! Shelby is beginning to warm up to my three dogs. She will approach them, sniff them and even lick them. However, she still gets nervous if they approach her. Shelby will now try to engage my special needs Aussie into playing with her. We still separate the dogs when we leave for work. Shelby gets the run of the dining room and my dogs get the run of the living room. On shorter trips, we have left all the dogs out together with no problems. We do separate all the dogs when they eat their meals. However, they have all shared treats and chews together with no problems. 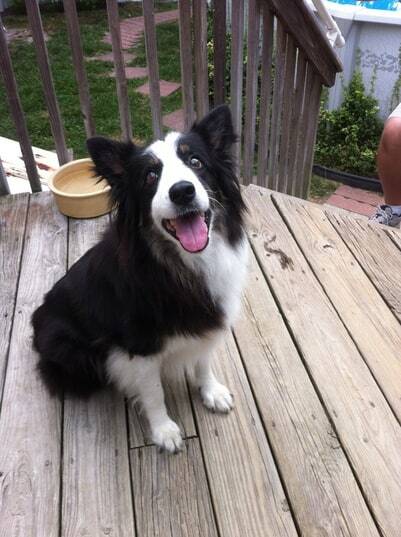 Shelby is a 6 year old tri-color, medium build Border Collie from NC. Shelby was found as a stray on the side of the road. She is diabetic and has cataracts. Shelby’s eyes are cloudy from her cataracts, but she may have some sight. Shelby is also missing some teeth. With her diabetes – Shelby requires two shots of insulin per day. Shelby can manage our small set of deck stairs and can walk around the house fairly easy. Indoors or outside – Shelby will follow and come if you call or whistle to her. She is housebroken. Shelby can also hear, but she does get a little startled when she hears new or unexpected sounds. Shelby was good while getting a bath. Shelby is eager to please and loves being near her people. She LOVES to be petted. Shelby’s ears perk up and she will wag her tail when you talk to her or call her name. Shelby also knows some basic commands like sit. She is a relatively quiet dog and is very content just lying by your feet. Shelby will happily take treats and will sometimes chew on a rawhide. Shelby is not a big fan of my other dogs that are younger: 4 year old Retriever mix, 4 year old Shepherd mix, and a 2 year old blind & deaf Australian Shepherd. My dogs are used to foster puppies that they can play with and boss around. Some growls and barks have been exchanged (with and without wagging tails), but no physical conflicts. All of the dogs are respecting each other’s space and are able to co-exist even in the same room, yard, and house. We are making progress. The dogs are slowly starting to make closer, gentle physical contact with no growls. Shelby is okay approaching my dogs. She will sniff them and lick their ears. However, Shelby gets uncomfortable if they approach her. I think Shelby would do best in a medium activity, relatively quiet home with no children or older children. Shelby would easily transition into a home as an only dog or into a home with an older dog. Shelby would be the perfect companion for an older couple or individual.